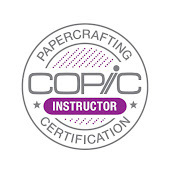 Time again to update the Copic Papercrafting Certification classes available. We are just beginning to open our Fall classes, so be sure to beat the rush and register right away. Some locations fill quickly, so secure your spot now! I must say, the Intermediate class is my favorite! We teach you how to color so that your images stand out more...more contrast, more believable colors, and more dynamic shading. We also teach you a bit about composition, helping you put your beautiful images together with paper and embellishments in a pleasing way. So, don't delay, register on our website now. Here is your chance to get more hand's on experience with the markers. Learn fun new techniques and head home with completed projects. These small classes are a great way to hone your coloring skills, and get inky on many surfaces. Anyone who has taken one of our Standard Certification classes is welcome to register! Next year there will be totally different classes offered, so register today, as locations are limited. Newly opened! Register now before it fills! Here is the final tree from yesterday. I colored the trunk with E33 and E29. I also threw in hints of B45 to gray it down. I also dabbed in a few spots of R22 into the leaves just for variety. You can't see it because it is subtle, but it is there. Let's look at another, more complex tree, with the sky colored in a similar way as yesterday. This time, both the tree and the sky are more complex. 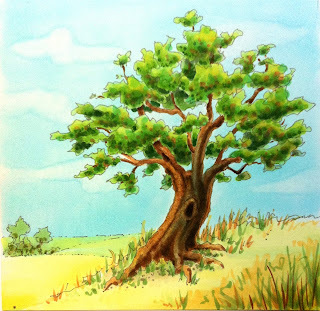 The tree again, is drawn with a 0.3 Warm Gray multiliner, on a piece of sketchbook paper. 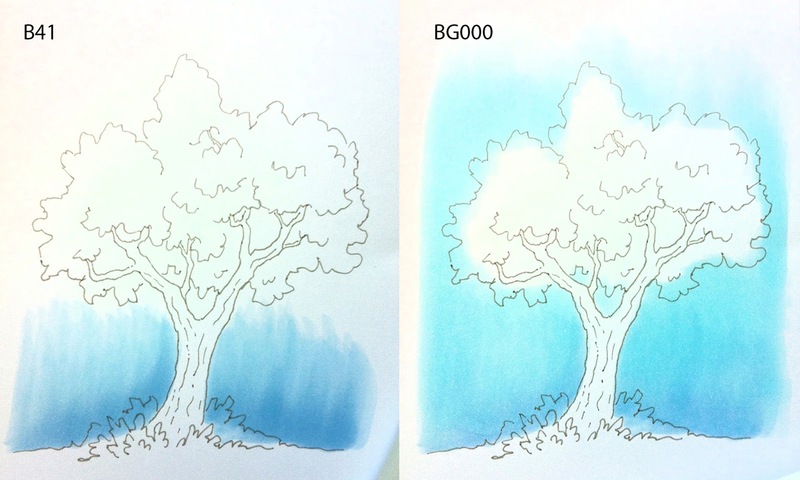 This time, I used the BG000 with my colorless blender for clouds. Here is a link to the technique tutorial I made a few years ago for making this style of clouds. Very simple, but nice, subtle clouds. Notice the fields in the distance, how I made sure to color those with the blue, darker farther away, and lighter blue close up. Again, I wasn't worried about going over the areas with leaves. Here is the final complex tree. I used similar techniques to yesterday, of dotting on layers and layers of color to make the leaves. I just used a wider range of colors. The fields below the tree are all colored with Y11, it just looks farther away because of all the BG000 underneath. I did add YG11 and hints of E33 to the scrubby bushes off in the distance. Nothing high contrast. Trunk: E33, E00, E27, E49, W5, Y11(for highlights) B41 (shadows). Leaves: YG11, YG13, YG17, G24, G28, Y11, R22, C2, C5. Grass: Y11, YR21, E33, YG11, YG13, YG17, W1, W5 (shadows under the tree). Most of these colors I lightly flicked in with the tip of the brush. Notice the grass closest to the viewer has the most contrast, grass under the tree has a little less contrast, and the rest of the grasses just softly fade off in the distance. I am so excited!!! Creative Ladder, our new online class resource is now open for enrollment. We have two classes to start, with more on the way. A quick tutorial today, as I look out at the beautiful summer sky. We have had a rather dry Summer so far, and I am starting to miss the rain. 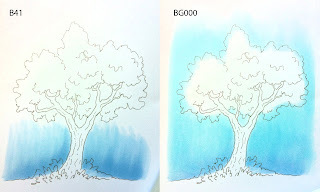 However, this is a great time to go over how to color a beautiful blue sky, peeking behind some trees. I drew this quick little sketch of a tree with one of the new Copic Warm Gray Multiliners. I love how light and sketchy these feel- not as dark as drawing with black, or as brown as the sepia, but it also doesn't feel like I'm drawing with a pencil (The cool gray multiliners look a lot like a light, fine-line pencil sketch). We have new brown multiliners as well, so check out our website for the full range of new sizes and colors. This was drawn on Copic Sketchbook paper, which is the same paper you can find in our new Mini Paper Packs. I added my sky first by layering some B41, then I came back with BG000. What I want you to note is how the BG brightened up the whole image. Also, see that I was not very careful about the edges of the tree. I went all over the lines. This is not a big deal, because I was trying to color fast and keep my paper from getting streaks or lines in the large blue area. A little blue under my green isn't going to bug me at this point. Also, it helps with the foliage behind the trunk, as that should be a little less vibrant in my final picture anyways. Next, I colored the leafy areas with a scribbly base of G12. In this case, I scribble fast in the center of the tree with the side of the brush. Then, I slow down around the detailed edges. I do NOT want that green to get out into the blue. Whenever I slow down, the paper gets soaked more, so those areas will be darker. This is fine, as it is pushing that lighter blue out of the way in unwanted areas. Down by the base of the tree, do you see the plants in back? They are already darker and less vibrant than the plants in front because of the blue base. Now, think about where you are going to have shadows. I am keeping this tree simple, so mostly my light will be from above. I actually am not too worried about shadows in this image, I just want a range of contrast on my doodle. Next, I dabbed in G24 and G28. I kept layering, dabbing, dotting, and adjusting the tones to get the look I wanted. I am careful to leave the brown trunk alone, as that area would look strange with green undertones. Don't forget the foliage at the base of the tree as well. Just keep dotting in colors until you are happy. To brighten up the top of the tree, I dabbed in a lot of Y11. Look at how it really warmed up the top of the tree. Tomorrow I'll put the finished tree up for you to see how I completed it. 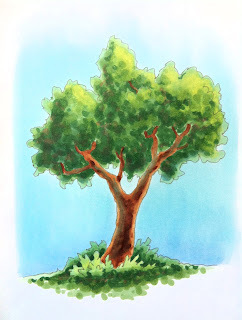 Meanwhile, if your really want to learn about REAL light and shadow, not just me goofing off with markers on a doodle, head on over to Creative Ladder and register for the Light and Shadow class taught by Sandy Allnock! 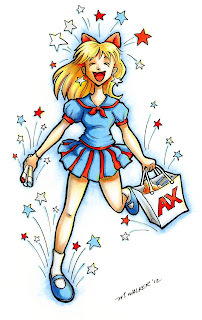 Happy 4th of July, and happy first day of Anime Expo! Do you know how to ink your ideas into a manga? This class teaches how to use manga paper, light tables, screentones, and inking techniques with Copic pens. Great for people who want to draw manga by hand, no computers needed! All supplies provided. Taught by Marianne. From choosing paper to inking and coloring, this class gives a basic overview of how to use Copic products for creating your own manga. Learn how to pick blending colors, how to color like the pros, and see an airbrush demo. All supplies provided. Have undead lurking in your brains? Need ideas for drawing your own withered corpses? This panel will unearth ways to bring your undead to life. The discussion will leave you crying out for brains. Drawing tools provided, zombie riot gear optional. Are you a total newbie to drawing manga characters? Come learn some quick tricks for designing your own characters. We’ll discuss basic inking techniques, proportion, heads, hair, hands, & more. Bring your ideas & questions! All supplies provided. Taught by Marianne. Industry Creature Designer Terryl Whitlatch demonstrates the creation of an imaginary creature and its place in a fantastic world, from its anatomy and appearance, to its place in story and script. Internationally acclaimed Creature Designer Terryl Whitlatch shares her art and experience in creating imaginary beings for Film and Animation, from Star Wars to Brave, and beyond. 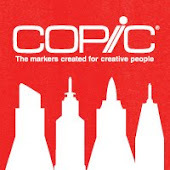 Also, come by our booth for incredible savings on all the Copic Products you need. We have markers, both individual as well as sets, we have refill inks, and we have an amazing array of papers, sketchbooks, screentones, and more. We hope to see you there! What a week! I taught classes this week on Tracing Memories, taught a teen drawing class for the City of Eugene Library, and got all of my prep done for heading off to Anime Expo in a few days. 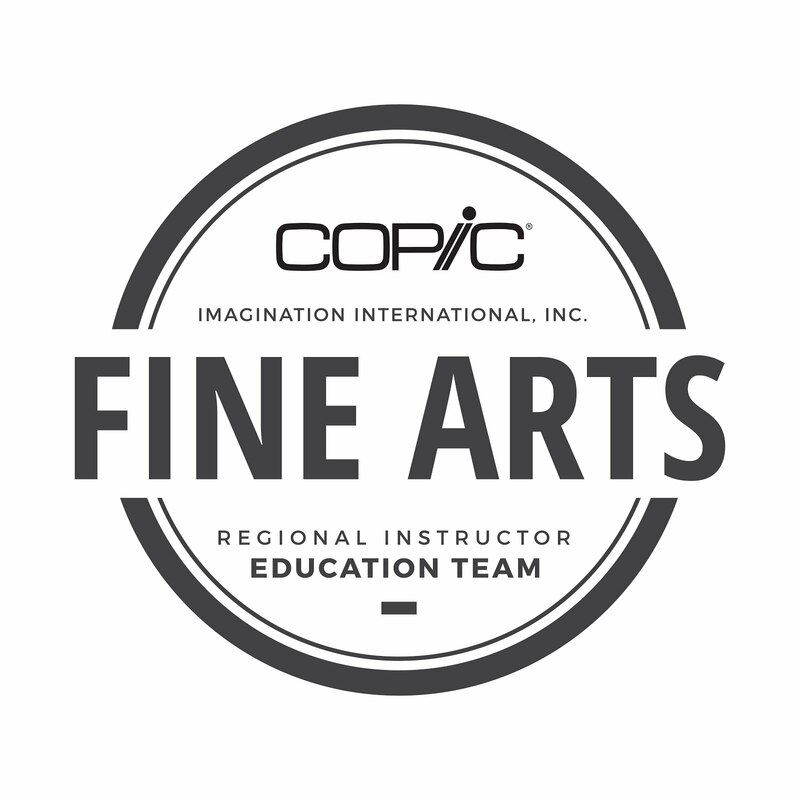 We have online classes opening up soon through Creative Ladder.com, as well as a new beading and apron class coming to Kansas City, August 17th (You can find out full class details and apply HERE on the Copic education page). And...I was so thrilled at how excited everyone is over the new book that Colleen and I worked so hard on!! Stop by the Copic Booth, located in the back with Artist's Alley. Prices will be great, and you can get personal demos throughout the entire show. 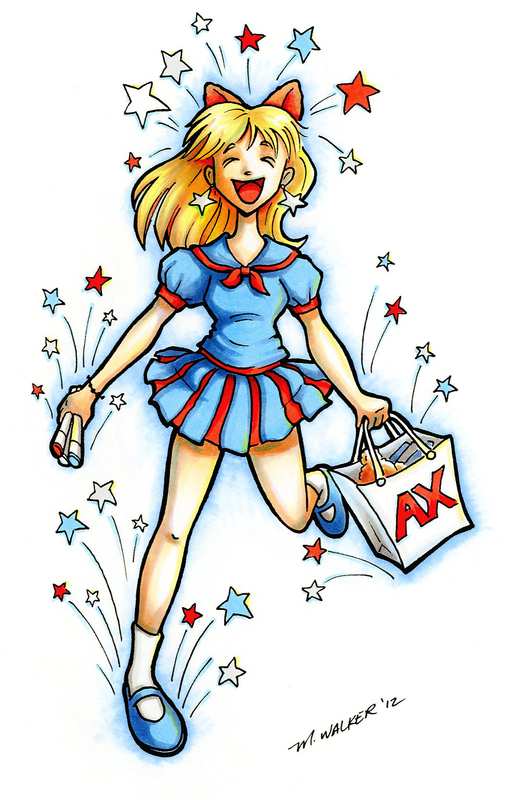 We will have 3 guest Manga artists from Japan, as well as Terryl Whitlatch from the Tales of Amalthea project. We have a full schedule of hands-on workshops and panels on July 5 & 6th. (I'll post more class details tomorrow). Stop by to get all your favorite Copic supplies and meet some amazing artists!! But, before I go to L.A., I need to share the winner for the 4th Copic Coloring Guide book blog hop! Random.org chose #95 out of 187 possibilities for a winner. Wow! Your coloring is incredible! Can't wait to get my hands on the new Copic Coloring Book! Thanks for the chance! Ellen, I sent you a note! Please get back to me and next week when I return from the convention, I will send out your very own copy of the book! !